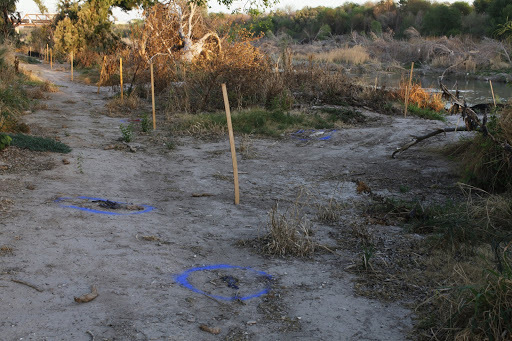 The U.S. –Mexico Border Project: Tracing the physical and psychological borderlands. What does the physical and psychological space of the U.S–Mexico Border look and feel like? As a visual artist I have been interrogating this question since 2007, traveling each year to work in Brownsville, Texas, Matamoros, Mexico and the surrounding Rio Grande Valley. 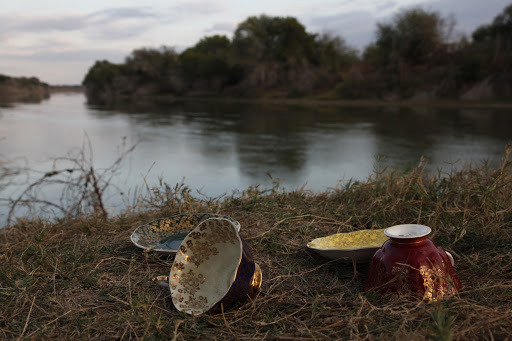 I walk the border and photograph the objects that are left behind as individuals swim across the Rio Grande River, change from wet clothes into dry clothes and continue their journeys to an uncertain future in the United States. I photograph the objects in place and then ship them back to my studio where I rephotograph them and place them in an Anti-Archive. These present day archeological remains range from toothbrushes and lipsticks, to passports and bullets, each coming with it’s own incomplete narrative and history of flight, surveillance, and fear. 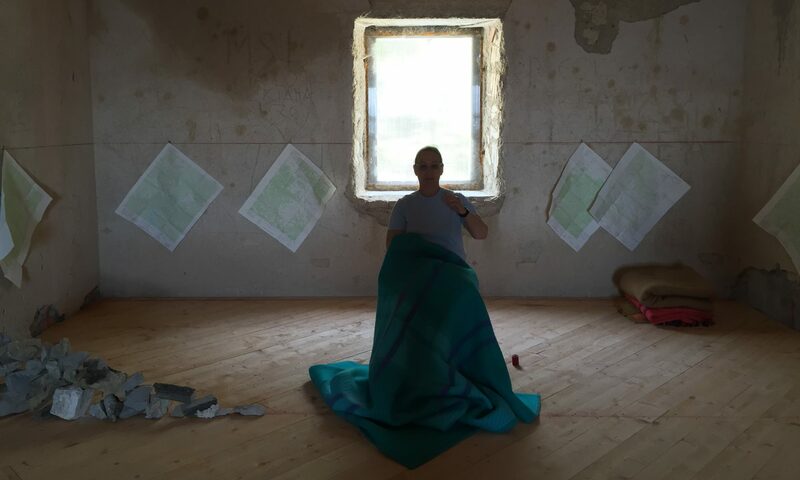 In 2009, I began a series of yearly site-specific art interventions, sometimes working communally and sometimes alone. The first year I worked with a group of artists from the United States and Mexico to create Crossing Over: A Floating Intervention (2009), a temporary floating bridge made out of colorful children’s inner tubes. 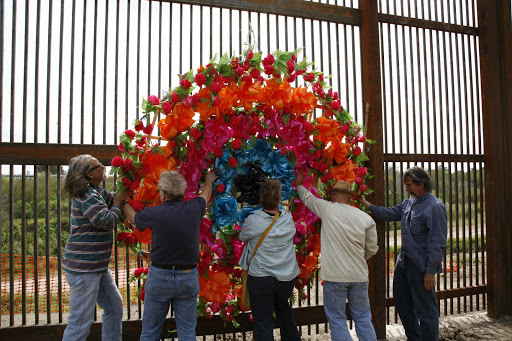 In 2010, I created Loss, a giant wreath that was placed on the newly erected border fence. 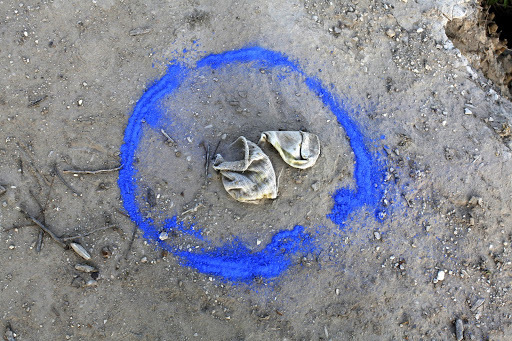 In 2011, I worked to change the landscape and meaning of the objects left behind by encircling them with protective blue lines in Blue Circle Project, Laredo, Texas. In 2012, I produced a series of performative pieces, Humanizing the Border,exploring the idea of body as border. For my final performance in the series, My Mother’s Teacups, I transported my mother’s bone china teacups that she had carried from England (where my ancestors are from) to the border and photographed them there to address the idea that most people in the United States are immigrants. 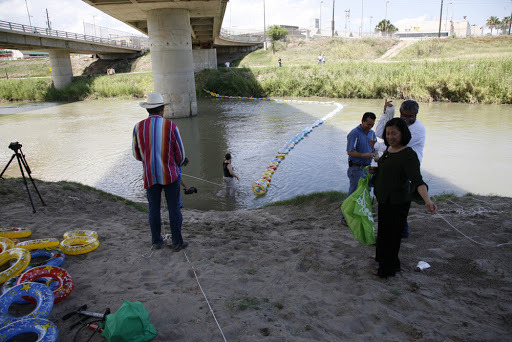 Crossing Over: A Floating Intervention, Brownsville, Texas and Matamoros, Mexico, 2009. 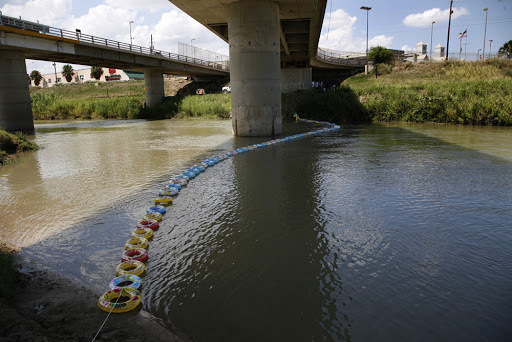 I worked with a group of artists from Brownsville, Texas and Matamoros, Mexico to create a temporary floating bridge made of children’s inner tubes that united Mexico and the United States underneath the Gateway International Bridge. We also created a Welcome Table from found materials and gave away swimming, running, and canoeing trophies to people crossing. Loss (Wreath), Brownsville, Texas, 2010. I made an oversize wreath and placed it on the Border Fence. The work was based on a found wreath from a local cemetery. I used traditional materials, processes and colors to create it. Blue Line Intervention, Laredo, Texas, 2011. I left the objects in place and drew a protective blue chalk line around them as I found them in the landscape. 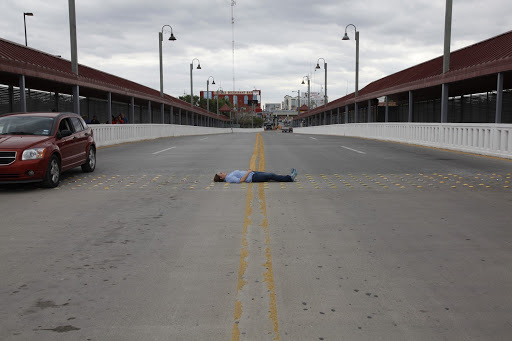 Humanizing the Border Performance, Nuevo Progresso International Bridge between the U.S. and Mexico, 2012. My body became the border. 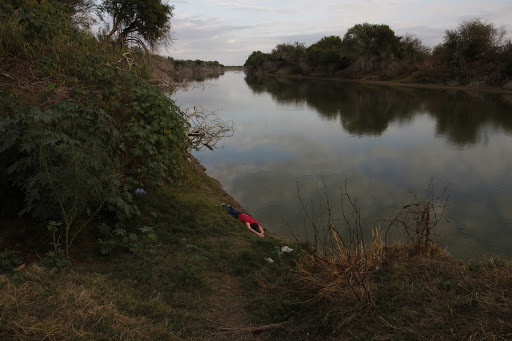 Humanizing the Border Performance, Rio Grande near McAllen, Texas, 2012 My body became the border. 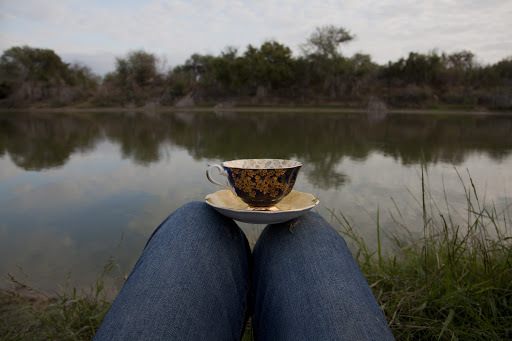 My Mother’s Teacups, Rio Grande near McAllen Texas, 2012. I transported my mother’s bone china teacups that she had carried from England (where my ancestors are from) to the border and photographed them to address the idea that most people in the United States are immigrants.